SATURDAY: ANNUAL BUSINESS MEETING - Join us for a continental breakfast at 8:30am with the meeting starting at 9:00am. The governance board will be proposing some revisions to NMBC’s By-Laws and Regulations. Documents for the meeting are available at the Welcome Centre or by following the link http://bit.ly/NMBCToday. If you have any questions please contact the Moderator, Jeremy Bast at (902) 580-7025 or jeremy.bast@outlook.com. SUNDAY MORNING - Join us for worship services at 9:15am or 11:00am. Pastor Daniel will bring us the second message on marriage in our A Mini On Marriage Series. 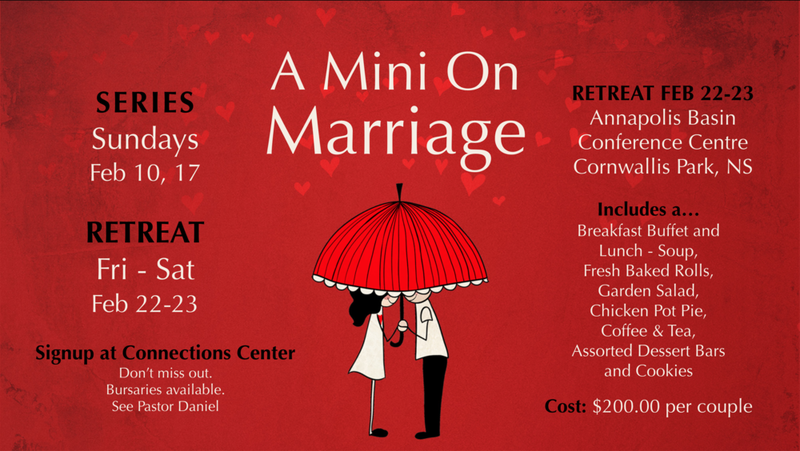 Our MINI ON MARRIAGE SERIES continues this Sunday and finishes up at the Marriage Retreat at the Annapolis Basin Conference Centre on February 22-23. For more info on the retreat, or to sign up, contact Pastor Daniel [daniel.cormier@nmbc.ca] or Mark Flawn [flonzie1@gmail.com]. FRIENDS IN RETIREMENT Thurs Feb. 21 at 11:00am. Our program will include a time of hymns led by Laurie Levy, a devotional by Dr. Stewart Brown and a fun game of "The Price Is Right" with Dave & Sheila Levy followed by a lunch served in the Cafe. WILD (Women Into Living Deeply) will meet Monday, Feb 25, from 7-8:30 at the church. Stay tuned for details. March 2 at 8am, come hear what God is doing in the life of fellow brother, Zach Cooper. Following our gathering in the MP Room we will meet for breakfast at the Louis Millett Complex. Then you are invited to participate in a fun mini tournament of Floorball (men and boys grade 8+). NMBC WONEN’S CONFERENCE - Mark your calendars. We will hold our 2nd annual conference on April 5&6. Come out for some wonderful teaching by Colleen Delong and worship led by Gina Cormier. We will have workshops by some fantastic women from our church. Cost $20 and includes lunch. Questions? Contact Lara Ingles (inglesfamily@gmail.com) or Laurel Jamieson (laureljamieson@gmail.com). THE AL IKARI FAMILY is coming on February 28! Please pray that we will find a great place for them to live, and that all will come together for their arrival. If you are interested in being an English tutor for the adults (no experience necessary) for an hour a week, please sign up at the Connections Centre. We still have items that the Al Ikari's need, including children's books and big and small items, please stop by the Connections Centre this Sunday to help out! Thank you! FOOD BANK SUNDAY is February. 24. A donation box is located at the Connections Centre. Envelopes for monetary donations are available at Welcome Centre. Cheques can be made out to "Fundy Interchurch Food Bank”. COLDEST NIGHT OF THE YEAR - February 23 - You are invited to make a difference in our community but walking and raising funds in support of Open Arms. 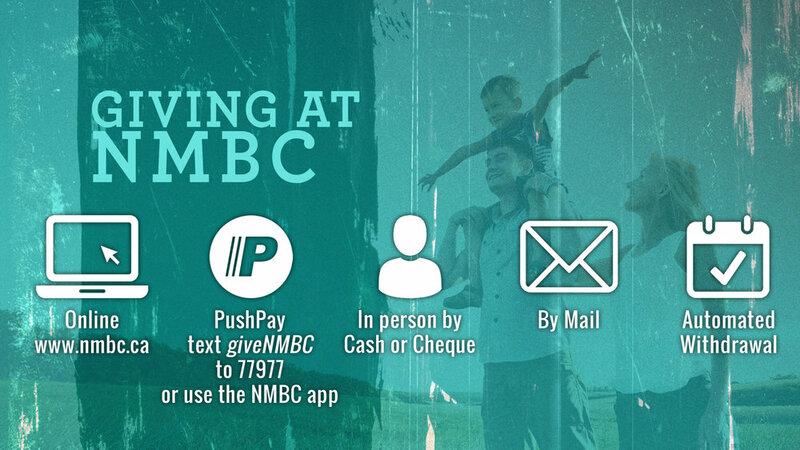 For more information see Pastor Jon and / or use http://bit.ly/19NMBCcnoy to donate or join our NMBC team. SEND-A-KID to CAMP FUND is our sponsorship fund at NMBC to provide bursary support to kids & youth who want to attend Christian camps. For many families, camp is expensive, and we want to offer support so that more children and youth can encounter Jesus and have life changing camp experiences! All money in the fund will go to applicants who need support to pay for camp registrations. First priority in dispersing funds will go to children or youth wanting to attend Kingswood Camp. For more info about the Send a Kid to Camp fund or to apply for sponsorship, please visit www.nmbc.ca/sendakid. If you want to make a donation to the Send-A-Kid to Camp Fund you can make your donation through PushPay, or mark Send-A-Kid to Camp on your offering envelope. For more info please see Pastor Jon. Everybody Needs The Essentials! That's what you get in this entertaining series from Focus on the Family. This elective introduces you to one of your greatest privileges - helping your child begin a relationship with God. You'll see how everyday conversations, family fun, and purposeful projects build spiritual foundations your son or daughter can rely on for a lifetime- and beyond.